Viva Mexico! 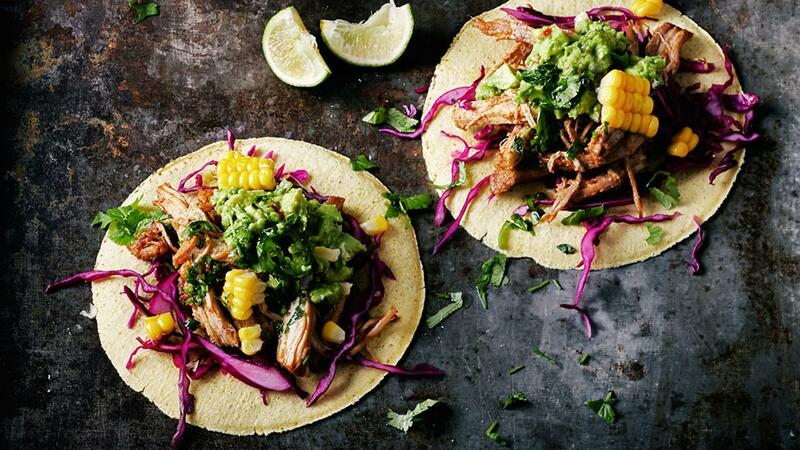 This recipe uses with pork and grilled pineapple, and is inspired by the Mexico City original called 'tacos al pastor', which is a fusion of Mexican, Caribbean, and Middle Eastern flavours. Rub the pork with the paprika, the oregano and the salt. Place on an oven tray. Add the cider to the tray, cover with parchment paper and tin foil and place into the oven for 2½ hours on low heat. Remove the foil and parchment and continue to cook for a further 30-40 minutes or until very tender. Remove the pork from the oven, cover with cling film and allow to rest for 10-15 minutes. Shred the pork. Finely chop the coriander, the mint leaves and the jalapeño pepper. Add vinegar, salt, cumin and olive oil. Grate the garlic on a zester, add to the salsa and stir well. Slice the pineapple and grill. Cook the corncobs and cut of the corn. Slice the cabbage in thin strips. Smash the avocados with a fork. First, put some cabbage on the tortillas, then the pulled pork. Garnish with avocado and salsa. Serve with a lime wedge and grilled pineapple.